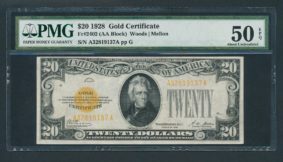 Small Size Gold Certificates are dated Series 1928. They have the distinctive gold seal and serial numbers and bear the signatures Woods and Mellon. Denominations printed were: $10, $20, $50, $100, $500, $1000. The two higher denominations are very rare. Also printed were $5,000, $10,000 and $100,000 Gold Certificates. 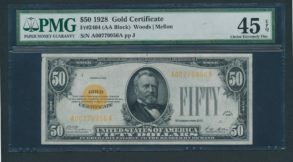 Regarding the $5000 and $10,000 Gold Certificates, none are known to exist (in public hands.) 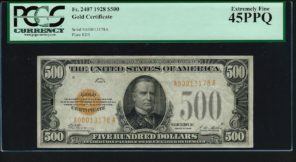 The $100,000 Gold Certificate is dated Series 1934. There are also none in public hands. Their use was intended exclusively for circulation within the Federal Reserve System.